"Our consumption levels have gone way down, we're choosier about what we eat, and we look for sales," Esperanza tells IPS in response to a question about how her life has changed as her family's income has shrunk in the last few years. Esperanza is a geriatric nurse with 13 years of work experience. She and her husband Antonio, an emergency room nurse, have seen their incomes cut nearly in half. They have two children, ages two and seven. Antonio is out-of-work and will receive unemployment benefits for eight months. "We went from earning 4,000 euros (5,000 dollars) between the two of us to around 2,000 euros (2,500 dollars)," says Esperanza, who works at the Regional Centre for Blood Transfusions in the southern Spanish city of Málaga. They are thinking about moving to Germany, to earn "decent salaries". In Spain, 35 percent of workers earn the minimum wage, 641 euros (814 dollars) a month, or less. And 40 percent of self-employed people are at risk of falling into poverty, according to a study by the Fundación Primero de Mayo, a local foundation, which warns about the growing impoverishment of working-class families. Esperanza wanted to join the general strike called for Wednesday Nov. 14, because "I think the situation is appalling." But she has to work as part of the skeleton crew that will keep the health centre running. The European Trade Union Confederation (ETUC) called for a "day of action and solidarity" Wednesday, which will involve a 24-hour strike in Spain and Portugal and three- and four-hour strikes in Greece and Italy, respectively. Protests will also be held in the Czech Republic, France, Poland, Romania and Slovenia, and solidarity demonstrations are planned for Austria, Germany, Luxembourg, the Netherlands and the countries of Scandinavia. Spain's general strike, the second faced by the right-wing government of Prime Minister Mariano Rajoy since it took office 11 months ago, was announced in October by the two main union federations, Comisiones Obreras (CCOO) and the Unión General de Trabajadores (UGT), along with the Social Summit, which groups more than 150 civil society organisations. After picking up groceries for her family at a food pantry, Tamara, a Málaga resident, tells IPS that she worked for years "caring for the elderly and as a cook in hotels. But I ended up without a job, and without benefits." She lives with her two sons, ages 17 and 24. The younger son is still in school and the older son is unemployed. Spain has the highest unemployment rate in the EU: 25 percent, and 50 percent among young people, according to the National Institute of Statistics. Of the 25.7 million unemployed people in Europe today – 10.6 percent of the economically active population – 18.5 million are in the Eurozone, according to Eurostat figures. All professions and trades have been affected by unemployment. Today, many engineers, traditionally a privileged class, find themselves without a job. "I went from earning 100,000 dollars a year, working abroad in an international firm, to 60,000 in a company that hired me when I came to Spain five years ago...and now they laid me off," aeronautic engineer Josué Escudero, who has two young children – ages three and seven – and an unemployed wife, tells IPS. The difficulties in finding work have led to a surge in the number of self-employed workers, whose ranks were joined by 65,100 newly self-employed individuals in the third quarter of 2012 – the highest rate of growth recorded by INE since 2006. "I left the company I worked for because I couldn't stand the psychological mistreatment anymore, or the workload," says Ali, a Russian woman who has lived in Spain for 14 years, and who worked for the past five years for a wholesale travel company. She is now working on setting up her own tourism-related business. But small and medium companies and family businesses are suffering from the drop in consumption. "The situation is really bad. I have never seen a crisis like this one," says María, who founded a shoe company 32 years ago with her husband, which she still works in, along with her two children. They once had eight stores and 14 employees in Málaga, but they had to close four of the shops, and she is now worried that they will not be able to keep the last four open. "If consumption isn't functioning, we can't function," says María. She hasn't taken a vacation in three years, and says she suffers from depression. Things are not much different in neighbouring Portugal. "Even though I never did it before, this time I'm going on strike," Marisa Ribeiro, a young Portuguese woman who works in a transport company, tells IPS. "They already told me I'm losing my job in two months. What else can I do in the face of a future mortgaged by Mrs. Merkel?" German Chancellor Angela Merkel, who visited Portugal this week, is seen as the architect of the increasingly unpopular austerity measures adopted in southern Europe. 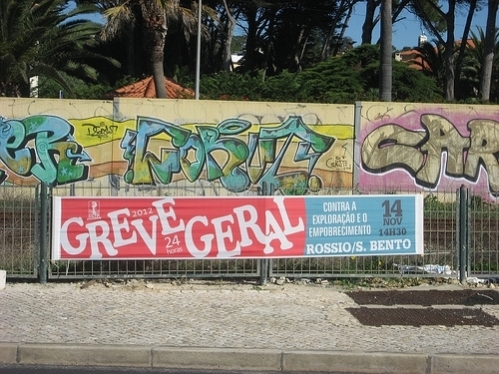 Wednesday's general strike, announced in September by Portugal's largest trade union confederation, the Confederação Geral dos Trabalhadores Portugueses (CGTP), is expected to be an unprecedented success in terms of the number of unions and workers who will join it. "Our family life has changed radically," bricklayer João Pedro Nogueira, a married father of two, tells IPS. Two years ago, he paid less in taxes and had "a decent salary." But his salary fell 22 percent, and his vacation and Christmas pay were eliminated. "My old Opel is falling apart, but I can't even think about changing cars. We used to be able to eat out for lunch on Sundays, but now that is an unthinkable extravagance," he says. Actually, his two daughters do eat meals outside the home – they eat breakfast in the school cafeteria, where some of the children are given meals. That was the straw that broke the camel's back – he says he is fed up. Among his work-mates there is "a great deal of fear now that the bosses can lay you off fairly easily," he says, referring to labour reforms that made it easier to hire and fire employees. But he is determined to "stand up and be counted" on Wednesday, and plans to join the strike. "And if they fire me, I'll emigrate to Brazil or Angola," he says. In Portugal, the workers who have been hit hardest by the crisis are public employees, "the victims of a brutal reduction in wages and the loss of their vacation and Christmas bonuses," CGTP Secretary-General Armenio Carlos explains to IPS. According to his estimates, "the buying power of these workers has fallen by 25 to 30 percent." And the recession in Portugal is only expected to deepen next year. * With reporting by Mario Queiroz in Lisbon.